As the road to reconciliation and reunification of the Korean people inevitably twists and turns, it becomes instructive to look at other models of division and reconciliation in history. The American Civil War, German reunification and pre and post-Apartheid South Africa, offer lessons, both good and bad, that can help inform the process that lies ahead for the Koreas. President Abraham Lincoln and his leadership during and after the American Civil War is a powerful example that can be revisited, again and again. His storied rise from the poorest backwaters of Illinois to the highest office in the land, his love for all people and his commitment to higher principles makes his one for the ages. In his remarkable wisdom, Lincoln saw the Civil War as a struggle to align America with its founding ideals. In this, Lincoln is rightly considered one of America’s Founding Fathers because it was his presidency that pushed America further down the road to become a nation “for, by and of the people”, with rights for all people as endowed by the Creator. 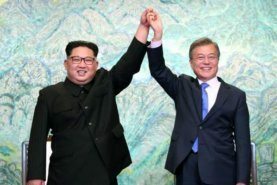 Moon Jae-in and Kim Jong-un holding hands during inter-Korea Summit. It was his commitment to a vision of this “just and lasting peace” that colored his presidential policies and even his everyday interactions with people. In Noah Andre Trudeu’s Lincoln’s Greatest Journey: Sixteen Days that Changed a Presidency, there is a story that captures Lincoln’s moral authority and his ability to embrace even former enemies. On his way back to Washington D.C. from a visit to General Ulysses Grant and his troops on the front line, Lincoln stopped at the Depot Field Hospital near City Point, VA. At the time, it was one of the largest hospitals in the U.S. Lincoln was determined to greet every soldier at the hospital, which housed between 5 – 6,000 wounded soldiers. Arriving at length opposite where I lay, he halted beside my bed and held out his hand. Looking him in the face, as he stood with extended hands: Mr. President, I said, do you know to whom you offer your hand?‘I do not,’ he replied.Well, I said, you offer it to a Confederate colonel, who has fought you as hard as he could for four years. I tell you, sir he had the most magnificent face and eyes that I have ever gazed into. He had me whipped form the time he first opened his mouth. Benbow’s account and Trudeau’s commentary that follows, shows how critical ethical and inclusive leadership is in the aftermath of conflict. 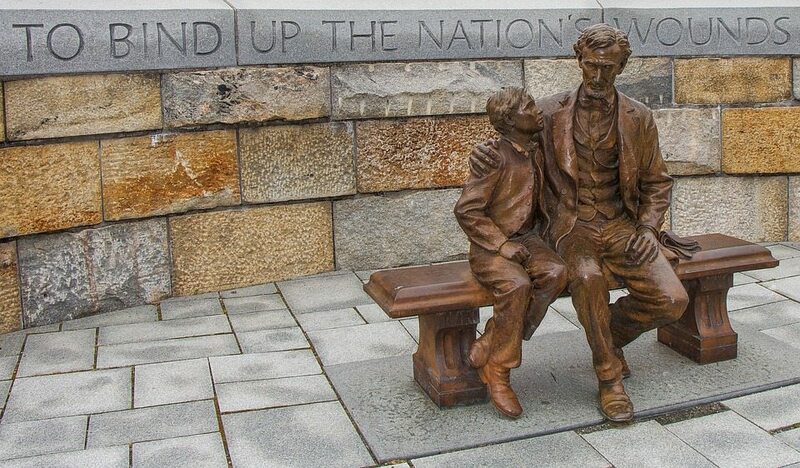 Lincoln’s commitment to a cause that transcended the agendas of North and South, coupled with his compassion for those who suffered the war, opened the door for former enemies to become friends in the work of rebuilding the Union. In his personal encounters and in his advice as president to his cabinet, generals and even businessmen, Lincoln demonstrated such a heart towards all people. In order to truly chart the way to peace and reconciliation, to union and reconstruction, there must be people who can lead the way. This will determine the story that follows any peace agreement. Will it be a story of forgiveness, repentance and reconciliation? Will it be a story of reunion? Will it be a story of building a shared future together?